Gilnahirk Tyres and Exhausts can check your tyres and its wheel alignment at a time which suits you. When wheels aren’t aligned properly, tyres might have to be replaced sooner than an owner expected. Damage can be caused to misaligned wheels which can put a driver’s safety and their passengers at risk. By looking at your tyres, you might notice that there is more damage on one side. If so, this could suggest that wheel alignment in Belfast should be done. Tyres naturally wear down but there should be damage on the same part of a wheel as each other. Gilnahirk Tyres and Exhausts can check your tyres and its wheel alignment at a time which suits you. When tyres have poor traction, this affects a vehicle’s ability to stop safely on hazardous surfaces, such as when there is snow around. If police stop a vehicle and notice that tyres are worn down, its driver might receive an on-the-spot fine and points added to their license. 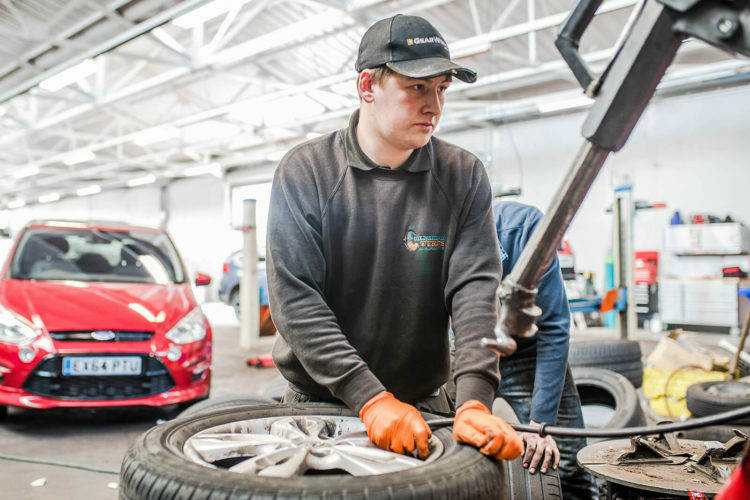 When you believe that your tyres need to be replaced or checked for misalignment, choose Gilnahirk Tyres and Exhausts for their wheel alignment services in Belfast. By booking an inspection appointment with our team, Gilnahirk Tyres and Exhausts can carry out wheel alignment in Belfast. When your wheels have been misaligned for a while, you will notice a significant difference after it has been corrected, such as how little damage is caused to tyre tread. Gilnahirk Tyres and Exhausts have a huge range of tyres which can be fitted to all vans, cars and motorbikes. Our team of experienced technicians can determine if a vehicle has misaligned wheels wherever you want. We can even visit whilst you’re at work to see if wheels are misaligned. Gilnahirk Tyres will not be beaten on price. Come down and have a look at our tyre deals. So, why not speak to us today to see if your wheels are misaligned? Gilnahirk Tyres and Exhausts will carry out a high quality wheel alignment service in Belfast.